In the fourth pAsuram, AzhwAr is meditating upon emperumAn‘s great quality of recreating the universe after it was in a subdued state with the [collective] offenses [of everyone] during deluge, which makes his quality of accepting SiSupAla, who already existed, with his transgressions, look inferior. Subsequently, AzhwAr mercifully meditates upon his greatness of recreating the universe which became subdued. See nanjIyar‘s introduction. There are many samsAris who are equal to SiSupAla. thanmai aRibavar thAm avaRkAL anRi AvarO? AL AvarO – will they become servitor? 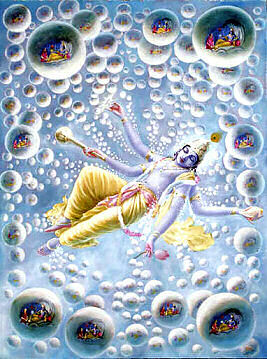 When none of the entities which are expansive in the form of puNya and pApa, having variations such as dhEva etc is present and everything remained void for a long period stretching thousand chathur yugas, emperumAn created water which is having goodness, and then brahmA and subsequently created all the entities which were in a subdued state inside him in a small portion of his svarUpam, having erased the previous inclinations; having meditated upon the ways/efforts of his nature, will they [materialistic people] become a servitor of anyone other than krishNa, who is the cause of universe? thanmai aRibavar thAm – Those who know the nature of truth. That is, those who understand that this creation is for his purpose; similar to SrI rAmAyaNam ayOdhyA kANdam 40-5 “srushtathvam vanavAsAya” (you were sired by me only to follow SrI rAma to the forest). Those who know that the cause of the universe is the one to be meditated upon; it is said in chAndhOgya upanishath “kAraNam thu dhyEya:” (meditate upon the origin/cause); in brahma sUthram too, after saying in 1.1.1 “athAthO brahma jigyAsA” (then, one enquires into brahmam), the rishi said in 1.1.2 “janmAdhi asya yatha:” (that which is the cause for creation etc). avaRku AL anRi AvarO – He gave the senses and body, only to use them in his service. panmaip padar poruL Adhum il pAzh nedum kAlaththu – being manifold, differentiated by being dhEva etc [dhEva, manushya, thiryak, sthAvara], having entities which are expansive due to their karma; during the time when such variations don’t exist for a very long time. ISvaran will annihilate the universe and keep it void for a long time just to hear the sound of voidness. Just as a farmer will store water on a field for a long time, to eliminate the saltiness in the cultivable land, emperumAn will keep them [various sentient and insentient entities] in their subtle forms to eliminate the evil inclinations, for the same duration that was spent in manifested [created] state [While brahmA’s day is engaged in creation, his nights are quiet, with no such activity]. In that time, when there is not even a small piece of matter, as far as one can see, and everything is in the state of “sath” (existence only). nanmaip punal paNNi – This is not like the water during deluge. As said in manu smruthi “apa Eva sasarjAthau“ (first, he created water). Until then, he directly engages with achith [this state of samashti srushti, where emperumAn performs adhvAraka srushti, direct creation; subsequently he creates sadhvAraka srushti, variegated creation, through others] and thinks “now that these two work according to my will, let me engage chith too in creation”, and creates brahmA [i.e. selects the most pious AthmA and gives him the post of brahmA]. Both chith and achith are subservient to emperumAn as said in “yasya AthmA SarIram” (All AthmAs are my bodies), “yasya pruthivI SarIram” (this material nature is my body) and so on. Like those who say “he has made a doll” [effortless accomplishment], as said in SvEthAsvathara upanishath “yO brahmANam vithadhAdhi pUrvam” (one who created brahmA first), “nanmaip punal paNNi, nAnmuganaip paNNi“. than uLLE – In a tiny fraction of his divine will. thonmai … – Back then, how he encompassed everything to be implied by the term “sadhEva” (sath only) and subsequently, engaged in creation as said in thaiththirIya upanishath “bahu syAm” (let me become many) and the ways through which he manifested. Will those who know his true nature, become servitor of anyone other than krishNa? thanmai – uNmai (truth). punal (water) is representative of other elements. thORRiya – created. Previous pAsuram stated that he gave his divine feet to his enemy SiSupAla – is this great? Or is his greatness of having simplicity [magnanimity] to create the enemies and let them trouble himself, great? This entry was posted in thiruvAimozhi, thiruvAimozhi 7th centum on September 7, 2018 by Sarathy Thothathri.